In this system the boards slide on bearings in the tracks. The board at the back is fixed and the other board can slide from one end to the other. Porcelain Ceramic writing surface in white for drywipe markers or green for writing with chalk is available. When the small boards are on the sides, the center can also be used for projection purpose. 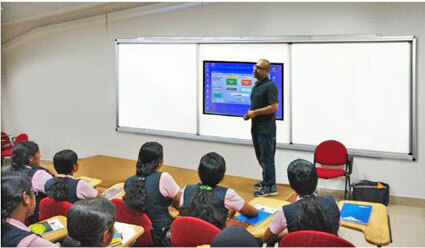 Alternatively an interactive board can be fitted in the center with two fixed writing boards on the sides. The front two sliding boards can cover the interactive board when not in use. 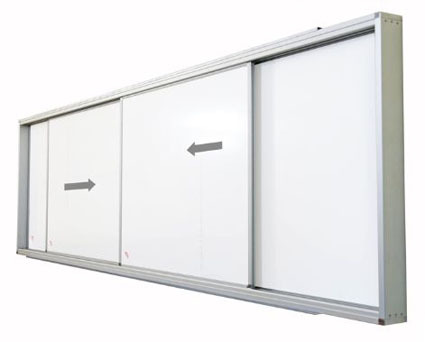 Two sliding boards of size : 1200mm x 1200mm and one full size fixed board at the back.